NKJV, American Woman's Bible is awesome! 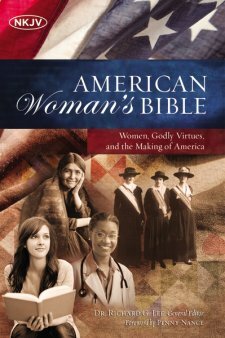 I absolutely love the cover of this Bible and have always been fascinated by influential American women throughout history. I also really like the articles that show how biblical virtues have shaped our nation. The inspirational quotes by or about great women, famous and not well known are a great addition to this Bible. With Independence Day approaching the release of this Bible is perfect. See how the brave women shaped our country by living by faith. This is a perfect Bible for those that love history! You can find NKJV, American Woman's Bible on Amazon, Barnes and Noble and other bookstores.